Discover Marrakech’s green oasis from atop a camel on this guided, 90-minute tour. First, make the short trip just outside the city’s medina quarter to the surrounding countryside and Palmeraie, the Palm Grove of Marrakech. 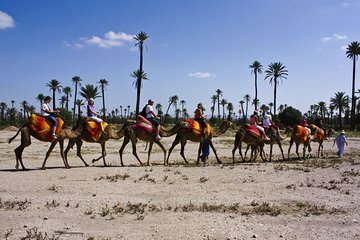 Climb on a desert dromedary and explore the desert villages and palm groves. Enjoy the scenic stroll, with beautiful views of the Atlas Mountains and Marrakech landscapes. A local hotel pickup and drop-off are included. We enjoyed the camel ride through the palm groves. Our kids loved it. We did not at all appreciate our driver insisting on kissing our 2 year old son when we repeatedly told him no. We will not book through Viator again because of the horrible driver experience. Booked this for a relaxing camel ride only to be told when we got there that it will be 20-30 minutes. After showing the booking details stated it would be 90 minutes, then the time changed to a 1 hour ride. We did enjoy the ride and the camels were beautiful calm peaceful animals who are picture friendly so we were still glad to have gone, but I would advise you take the booking details with you to ensure you get what you paid for. All in all, still an enjoyable trip! We had problems trying to contact Maroc Excursions to reconfirm booking time and pick up location. My advice is to make sure you get in contact as soon as possible and keep ringing them - unfortunately they only provide one number and it's Moroccan, so there'll be international calling charges. The taxi driver arrived at our riad without any notice while we were still eating breakfast, so we had to rush and get ready. He was annoyed with us even though we didn't know the trip was still happening, so it was a silent 20 minute ride to Palm Grove. To make it worse, he couldn't speak English at all so we couldn't explain the situation to him. It was uncomfortably tense and regretable. The guide we had was very very nice guy but he couldn't speak English very well. He did take some great pictures for us, but didn't explain any of Palm Grove, the camels or anything explained to us. It was a silent 45 minute not a 1.5 hour like promised camel ride, and he was aggressive in asking for a tip after the ride. The trip was OK but wouldn't recommend to anyone. We chose this because it was the cheapest camel ride trip on Viator but in reality it felt overpriced and disappointing. The only up side is that we did get to ride a camel in the end, in the traditional berber gear. Very relaxing and wish I went for a longer ride, would highly recommend. The guides have a good bond with the camels and they are very friendly considering they're camels! Also the palm trees were pretty wonderful too. This excursion was so relaxing and the views were great. We went during sunset and it was awesome. They even dress you up for the ride. A really great experience, organised well and looked after.